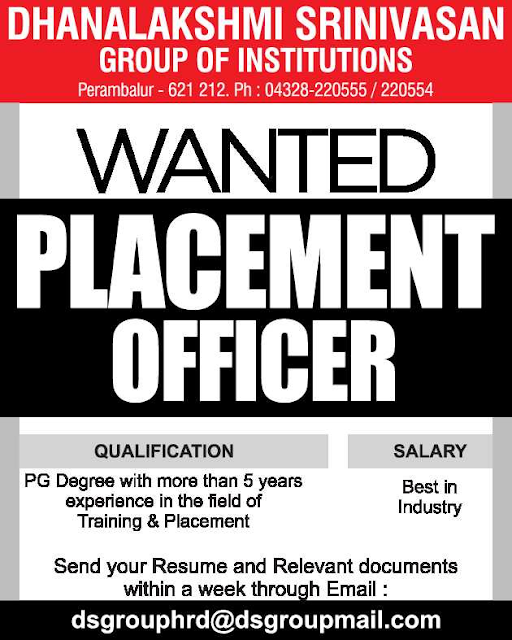 Dhanalakshmi Srinivasan Group of Institutions, Perambalur has advertised in THE HINDU newspaper for the recruitment of Placement Officer job vacancy. Interested and eligible job aspirants are requested to apply within a week from 01st August 2018. Check out further more details below. About College: Established in the year 2001, the college strives to impart quality education in the field of engineering and technology through a stimulating and innovative environment. The college is recognized by AICTE, New Delhi and affiliated to Anna University, Chennai. Since inception, the college strives to establish itself as a world class nodal center of learning, research and training. How to Apply: Interested and eligible candidates are requested to send application along with CV, copies of certificates and PP size photo to the following email address.